In a nutshell, the ancient Khmer kingdom of Cambodia received a particularly sharp and pointy end of the Colonialism stick. During the US/Vietnam war, the Viet Cong crossed the border into Cambodia and there they set up sanctuaries and bases to overthrow the South Vietnamese government. The US responded by starting a 4 year secret program of bombing these sanctuaries (Code Name, Operation Menu). Vast areas of Eastern Cambodia were carpet-bombed. Estimates for civilian deaths range as high as 250,000. Meanwhile an indigenous Cambodian revolutionary movement called the Khmer Rouge gained momentum. So, rather than eradicate the VC outposts, the US bombing campaign drove them further into Cambodia where they met up with the Khmer Rouge and aided in the ongoing Cambodian Civil War. The US backed government fell and on April 17, 1975 the Khmer Rouge marched into Phnom Penh. The war weary population greeted them as victors, but the Cambodian population’s nightmare had just begun. The Khmer Rouge began to enforce their ideals, essentially a radical form of agrarian communism wherein family, wealth and status were irrelevant. Family groups were broken up, the currency and postal system were abolished and everyday life, as Cambodians had known it, was turned upside down. Within hours of their arrival the Khmer Rouge began to clear the city of its inhabitants. Within a week the city was deserted. Over the next 3 years, 8 months and 23 days 2 million people were killed. The killing was systematic: political leadership, the monks, the educated, the elite, even people who wore glasses were singled out. 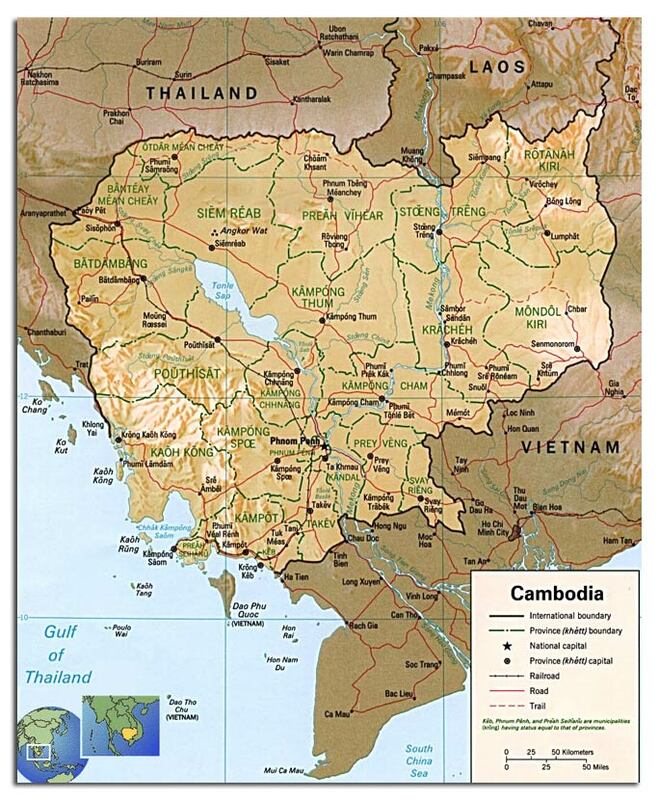 Finally in 1978 the Vietnamese invaded Cambodia and nominally took control, though civil war and famine coursed through the countryside for much of the 1980s. And what all of this served to do was to create a country that had very little means of developing itself out of its ongoing nightmare. The population that remains has weathered years of bloodshed, poverty, famine and political instability. Moreover they have done this (against all odds) with a smile on their face. And the country is beginning to pull itself together. But there are hurdles. In researching this trip, my eyes were reopened to the scope and scale of the situation there. Statistics such as : “Average per capita annual income= ~$300 USD per year” Or “10 million land mines still in the ground” jumped out at me. I began to get an overwhelming sense of White Guilt. Something about traveling to a country, walking around, seeing the sights, and then just washing my hands and going home hit a sour note with me. It seemed like taking, without giving anything back. So recently I went to visit a couple in Northern New Mexico who supports orphanages in Cambodia through their organization, Cambodia’s Hope. They offer assistance to children and families in the form of survival support, education and occupational training. Their goal is to help the children to learn, play and create, which will enable them to start on a developmental path towards leadership roles in their country. So rather than just going a-touristing, I spent some time with the kids, took them on some excursions. To be sure, I did wander around the country taking in the sights. But the time spent with the kids allowed Cambodia to sink a little deeper into my bones. What follows is a smattering of words and images. I took 5,461 pictures while I was there. Out of those raw files I processed about a thousand and then further culled the heap into what you see here. I also wrote some words about it all. I dunno if any of it is any good at all. But it is what I saw and felt. A reasonable question at this point would be: “So what? Why go through all of the trouble?” I go through the trouble not to show off, but to share. I am lucky to be able to take a trip like this, and it was an emotional rollercoaster ride. If I can be accused of anything here, it is of wanting to convey some part of those feelings.